By a News Reporter-Staff News Editor at Women's Health Weekly -- Chevy Chase, MD-A tomato-rich diet may help protect at-risk postmenopausal women from breast cancer, according to new research accepted for publication in The Endocrine Society's Journal of Clinical Endocrinology & Metabolism (see also Breast Cancer). Breast cancer risk rises in postmenopausal women as their body mass index climbs. The study found eating a diet high in tomatoes had a positive effect on the level of hormones that play a role in regulating fat and sugar metabolism. "The advantages of eating plenty of tomatoes and tomato-based products, even for a short period, were clearly evident in our findings," said the study's first author, Adana Llanos, PhD, MPH, who is an Assistant Professor of Epidemiology at Rutgers University. Llanos completed the research while she was a postdoctoral fellow with Electra Paskett, PhD, at The Ohio State University Comprehensive Cancer Center - Arthur G. James Cancer Hospital and Richard J. Solove Research Institute. "Eating fruits and vegetables, which are rich in essential nutrients, vitamins, minerals and phytochemicals such as lycopene, conveys significant benefits. Based on this data, we believe regular consumption of at least the daily recommended servings of fruits and vegetables would promote breast cancer prevention in an at-risk population." The longitudinal cross-over study examined the effects of both tomato-rich and soy-rich diets in a group of 70 postmenopausal women. 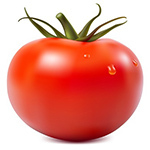 For 10 weeks, the women ate tomato products containing at least 25 milligrams of lycopene daily. For a separate 10-week period, the participants consumed at least 40 grams of soy protein daily. Before each test period began, the women were instructed to abstain from eating both tomato and soy products for two weeks. When they followed the tomato-rich diet, participants' levels of adiponectin - a hormone involved in regulating blood sugar and fat levels - climbed 9 percent. The effect was slightly stronger in women who had a lower body mass index. "The findings demonstrate the importance of obesity prevention," Llanos said. "Consuming a diet rich in tomatoes had a larger impact on hormone levels in women who maintained a healthy weight." The soy diet was linked to a reduction in participants' adiponectin levels. Researchers originally theorized that a diet containing large amounts of soy could be part of the reason that Asian women have lower rates of breast cancer than women in the United States, but any beneficial effect may be limited to certain ethnic groups, Llanos said.